Here at Vintage Tub & Bath, we’re always on the lookout for great quality brands at affordable prices, which is why we’re excited to add Bocchi to our collection of kitchen sinks. Bocchi is an Italian-based company who has been a leading brand in bathroom and kitchen products for 66 years. The selection of Bocchi kitchen sinks available at Vintage Tub & Bath features farmhouse, fireclay, and undermount sink styles. Choose from several Bocchi collections, including Classico, Vigneto, Contempo, and Sotto. There are many benefits to choosing a kitchen sink from our Bocchi line. Many styles are available in several different finishes, including biscuit, black, dark grey, matte black, matte brown, matte grey, sapphire blue, and white. 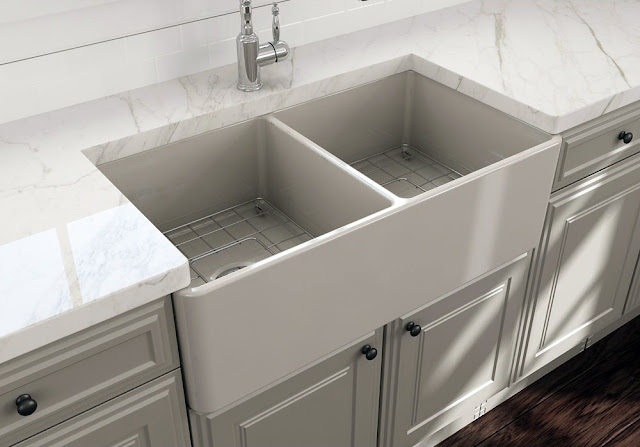 Bocchi fireclay sinks feature an exclusive high pressure casted fine fireclay protection to ensure the sinks durability and to provide a lasting elegance. Each sink comes equipped with a sink grid and drain. Apron designs are available with decorative or smooth lips. Choose from three shapes – rectangle, round, and square. Each Bocchi sink features a non-porous, uniform, scratch and stain resistant surface. Capable of withstanding extreme heat from pots and pans. If you’re searching for a kitchen sink and have questions about our Bocchi sink line, call Vintage Tub & Bath at 877-868-1369 or send us an email at supply@vintagetub.com.